Tony Stewart, history of violence on track. Wrongful death lawsuit? Home Scandal and Gossip Tony Stewart, history of violence on track. Wrongful death lawsuit? Spiteful or just the make up of a veteran who sees no wrong resorting to violence? Whilst veteran NASCAR driver Tony Stewart has for the time being escaped charges stemming from Saturday’s night’s incident which saw fellow track rider, Kevin Ward Jr killed at what many are wondering willfully at Stewart’s hands, new questions have surfaced with the release of new information. 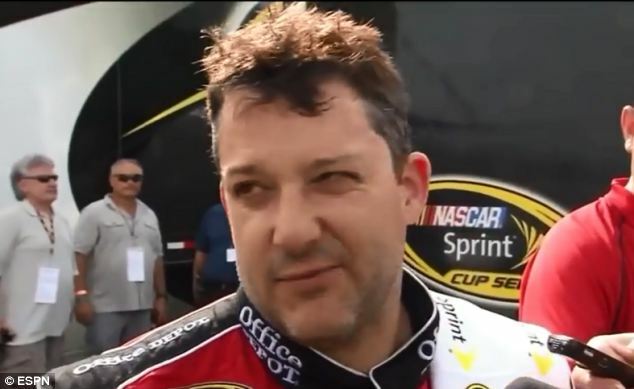 Did NASCAR champion Tony Stewart willfully run over and kill Kevin Ward Jr? 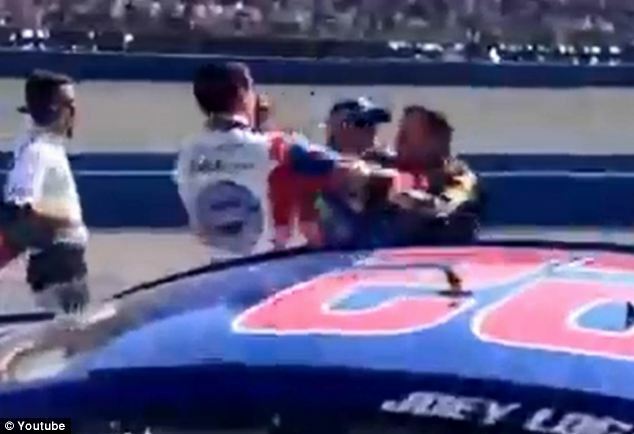 The revelation comes as previous dug up video footage of the veteran over the course of the last decade goes on to show Tony Stewart in a variety of confrontations, lending credibility that the NASCAR driver thrives on aggression and has a history of physical confrontation. 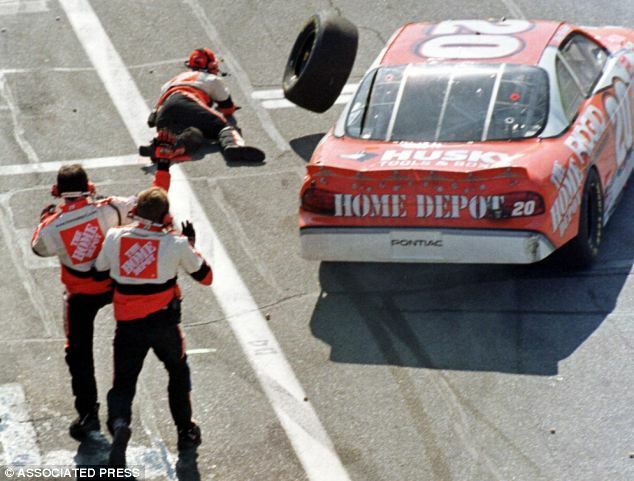 Video footage stemming back as far as 2002 shows in one instance the veteran erupting at fellow drivers, filmed plowing down pit crew members, threatening to run fellow competitors off the track, shoving drivers in anger and even throwing his helmet at a car. Yet it was Saturday night’s confrontation which has ended up being the most lethal, as a young irascible Kevin Ward Jr is seen jumping out of his crashed vehicle after being clipped by Tony Stewart and taking to the middle of the field, presumably to give the veteran a piece of his mind only to be hit by Stewart’s car as Stewart inexplicably revs up his engines as he turns to pass the fallen driver, this despite the fact that caution flags have been raised. A point of contention which has caused many to wonder had the veteran sought to teach Ward manners, who was in fact the boss or was it a situation of Stewart merely attempting to scour dust in the young man’s face only to see the 20 year old tragically sucked up under Stewar’s car as the back part of his vehicle swayed sideways, collecting Ward and hurtling him down the field a further 50 feet? To date, authorities have told no criminal charges are pending against Stewart but nevertheless they did indicate that the investigation is still ongoing and video and photos of the incident still need to be studied. With the investigation still underway, criminal charges could still be filed or Stewart could face a possible wrongful death lawsuit, Sports Illustrated reported. There has been speculation that the death came after a rivalry between Ward and Stewart. 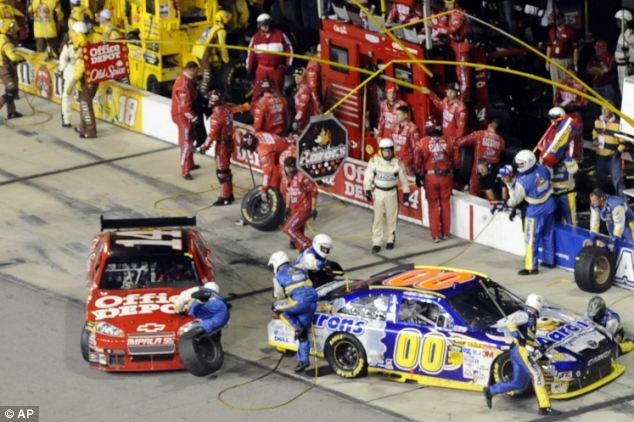 But the spats are just the latest for Stewart – whom the New York Times called ‘NASCAR’s resident hothead’. Like Ward on Saturday, Stewart, the fourth-highest paid NASCAR driver, tells the UK’s dailymail has a history of often climbing out of his car following collisions to give the driver a piece of his mind. 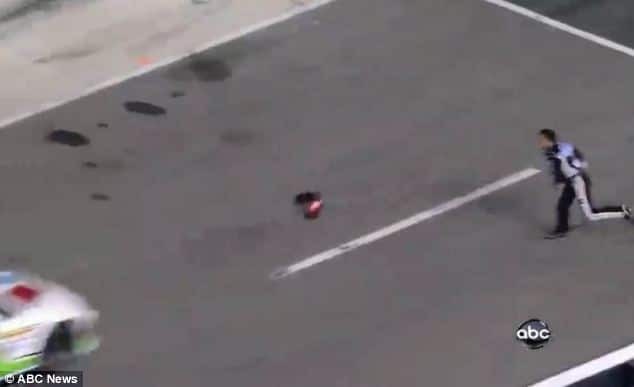 One notable incident was in August 2012, when Tony Stewart threw his helmet at Matt Kenseth’s car during a Tennessee race. The helmet hit the vehicle square on the hood as it sped past. Afterwards, Stewart said he would ‘run over‘ Kenseth ‘every chance [he] got’. 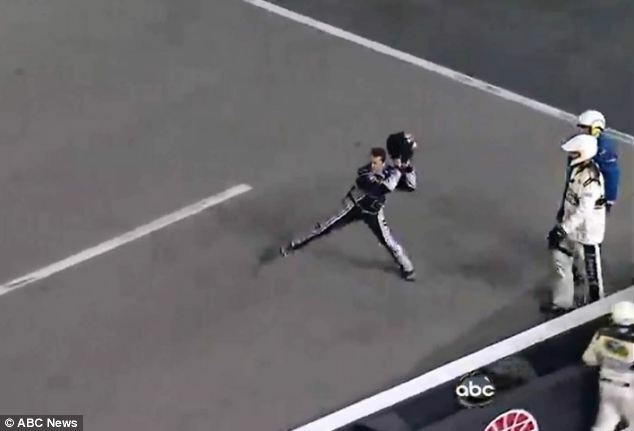 In March 2013, he accused Joey Logano of blocking his car in a race in Fontana, California and when it was over, he stormed towards him, shoved him and threatened to run him over. The two men were eventually separated by their crews. Saturday’s crash site is also the same track where Stewart was involved in a July 2013 accident that seriously injured a 19-year-old driver. He later took responsibility for his car making contact with another and triggering the 15-car accident that left Alysha Ruggles with a compression fracture in her back. Nevertheless some have said that the show of anger and verve is simply part of the sport and culture and that fans have come to love the confrontations and often wildly cheering from the stands. After Saturday’s tragedy, Stewart pulled out of a race scheduled for Sunday. ‘There aren’t words to describe the sadness I feel about the accident that took the life of Kevin Ward Jr.,’ Stewart said in a statement that was released on Sunday. David S. Weinsten, a former state and federal prosecutor in Miami would also opine it would be difficult to prove criminal intent. Retard ? – It seems, you claim you read it – make a second try – so far you get the top score for stupidity among that “general public”! Why couldn’t it be a reply ? Few days ago Tony wouldn’t have minded caling somone a retard to their face. OldArkie says: ‘It seems …’ – If you look at facts like Tonys history of reckless bahaviour (like – without warning – fiering a flamethower in the workshop in between a camera crew with a female journalist dressed in flamable, and his own crew and cars – also on youtube), his arrogance, judgment of others, violence, reckless driving (including hits on pittcrews), threats, jokes on katastrophies he created and anger isues … it rearly SEEMS ! If that don’t help, you can watch the video, where we both hear and see Tony hammer the speeder under yellow flag, and releasing it equaly fast, just before passing a wreck, and then making an expert escape from hamering the outside wall by balancing the car on stering wheel and speeder with a corps blocking his right rear tire. Lucky it hamered the wheel in the air, and we got no bumps in the front of his car. Watch the following cars, where the leading is far ahead of Tony in reaction, and actualy force the following into an ilegal overtake under yellow flag. I only drive a pedal bike, but if i do something like that first action in a slippery curwe with my old cripled legs, sends me fishtailing outwards. It’s probably something similar in a multi hekto horsepowered car, and a driver with the routine and experience of Tony, who expect others to race flawless, and threat to create accidents on them – when they don’t, shouldn’t make such a fatal mistake, ewen if he didn’t see the black person on the dark track through a muddy windshield before last second – and got supriced. He don’t roll over Kevin, he create a meatgrinder with sideway spinning wheels. That’s no sweat when you’r safe in a rollcage. I do hope OldArkie is wrong, and that Tony WAS a timebomb. Chanching atidude now, would seem a nice display of respekt to Kevin. When did Tony sign off the sunday race ? I hope it was before he discovered investigators met up on the track to aske aditional questions. As a biker and a walker i meet “Tony Stewarts” almost every day, even now when i only go out for short moments, that’s why i’m interested in pzykopatik alpha individuals and racing. I’v been down several times in my life – sometimes serious, once with life long injuries, and the police don’t give a dam. In fact i had to stop my limping steps in the footpath closest to my home, to avoid getting run down by the local cop, who in a unmarked car sped the turn and accelerated out (like a lot of drivers do when aproaching an ocupied footpath to pass ahead of the walker) aditionaly with one hand on the wheel and the phone to his left ear just ½meter away from me. I could have grabbed his phone with a bend arm, if the side window had been down. My foremost foot must have been closer to his wheels. but being choked to recognize him, i missed looking for it – also doubtfull it could be done in that fast pass. I remember it was the hard injured leg, because my first thought was, the doctors had told me, they may have to remove it, if it’s injured again. I’v seen such reports in cases with a broken stick and relatives claiming the corps could hardly walk, and repreciated getting an arm when going up or down a tall footpath. (SEEMS they all use all their remaining strenght getting suecidal in thir final moments). Glad they look into it, when it’s recorded and hit world news. It took 50 years to find the fotage showing what Hawthorn did to kill and injure the still unknown number of spectators in LeMans. Mercedes who had no guilt at all, and withdrew from the race, was blamed and acused of using ilegal dangerous fuel. Hawthorn cried in the pitt, but smiled when celebrating – in spite of the corpses and lazerations. The french did all they could to cover up and keep the popularity of their great tourist atraction and money machine. (There are still people registrated as missing, where relatives claim they could have gone to watch the race). Hope this works out faster. If we don’t learn from such incidents and change, they will repeat. As usual many things seem a factor, and this episode resembles ordinary roadrage. Among others Kewin shouldn’t have been there. He would have been safe in the wreck until the track personal arrived. Maybe he tried to step away, but failed in the mud. Tony should have been idle, as far from the wreck as possible. Maybe he just wanted to perform a bit mudspray as part of his usual rough practikal joking. Maybe a bump lifted a wheel momentarily off the track, and prevented him from forcing the car into the curve. Don’t expect OldArkie think Tony wanted to kill a kid. Kevin was a great driver, who’s carer in many ways resembled Tonys early years. He had proven he could beat Tony, and Tony had proven he could push Kevin, but such guys need each other to create entertainment on the track. 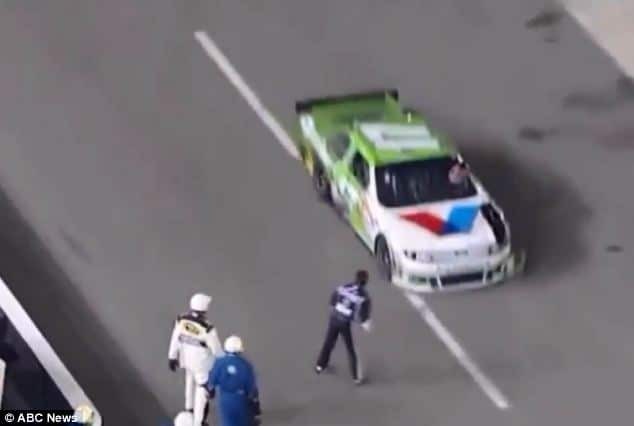 Tony know, what we lost, this will haunt him the rest of his life, and if he at some point return to racing, i expect him to fight his alpha atitude, respekt his oponents, and realize a joke isn’t worth any risk, and a win isn’t worth any price. He don’t mind risking his life, but maybe he will understand you have no right to force aditional risk on others. We are all responsible for safty. As for you, i expect – in the future – you give people a chanse to reply to unargumented insults. This time i will do it for you. It seems that Stewart is a time bomb, & it finally exploded big time.